Tom Robertson Architects has designed the boutique offices for a branding agency located in Melbourne, Australia. 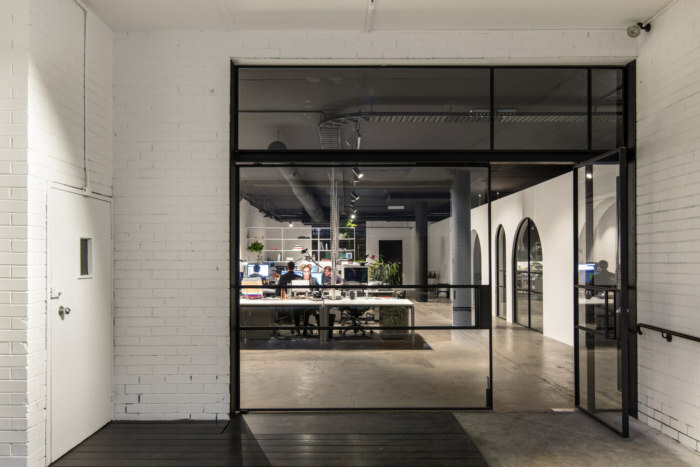 Canyon Studio is an exciting transformation of an existing warehouse shell, creating a contemporary boutique office space for a branding agency. A new feature arch wall is a clear delineator, dividing the meeting rooms and kitchen on one side from the busy staff workspaces on the other. The clean, contemporary lines of the archway are strikingly juxtaposed with the industrial warehouse. Painted black, the original columns and exposed services become a backdrop, highlighting the white arch wall intervention. Against this minimalist palette, the bold kitchen injects colour into the space. The strong blue creates a narrative thread between the contemporary additions; the kitchen and office carpet on the same side of the wall are graphically framed by the arch. Blue is used again in the bathroom grout, establishing a delicate continuity between the spaces.